Trade policy activity in the U.S. was a major focus for our readers in April, accounting for 11 of the top 20 most read articles. The most read was our outlook for President Donald Trump’s next 100 days, and trade tasks to be dealt with. Meanwhile the machinations of NAFTA, national security reviews of steel and aluminum and relations with China also got a lot of attention. The logistics industry also featured, including our consolidation-focussed market share pieces on carriers and NVOCCs, first quarter earnings preview and an analysis of alliances’ antitrust risks. To find out more about Panjiva research email sales@panjiva.com. #1 12 Tasks for Trump’s next 100 days (April 26) We reviewed President Donald Trump’s first 100 days’ activity in trade, and identified 12 areas that need to be developed in the next 100 days. Deadlines are faced in: starting NAFTA talks (having gotten his USTR pick approved) and addressing a dispute; delivering the Omnibus trade review and implement its findings; and making good on the 100 day plan with China. He will also need to make progress in: challenging WTO legitimacy; developing concrete plans with Japan; responding to Asian trade dealmaking; addressing tax policy including BAT; and dealing with at least seven trade cases started since the beginning of the year. Finally the President may need to pay more attention to India and stay clear of European politics. BUY AMERICAN! OH, YOU ALREADY DO DESPITE THE SURPLUS? #2 Not pushing the big red NAFTA button (April 27) After a hectic week President Trump decided not to exit NAFTA and instead renegotiate. We flagged the risk to exporters – NAFTA accounts for 34% of U.S. exports and only 19% of the U.S. trade deficit. #3 Trump-Xi get building (April 10) President Trump’s first meeting with President Xi set the groundwork for a 100 day plan to boost U.S. exports. Easy wins could include agriculture and energy, our analysis showed, though there are plenty of hurdles ahead. #4 Passed “peak China”? (April 4) The culmination of our monthly analysis of the U.S. trade balance showed the average trade surplus held by China vs. the U.S. hit its lowest since November 2014 on a trailing annual basis in February. The March analysis started shortly afterward – see article #16 below. #5 Shipping consolidation marches on (April 11) Our monthly reading of U.S. inbound carriers’ market share showed the top 20 added 4.7% points to their market share on a year earlier to reach 63.1%. Controversy is starting to surround the sector though, as article #20 shows. #6 Billion dollar sovereignty call (April 14) The NAFTA dispute panel ruled against a U.S. tariff decision on Canadian paper, while NAFTA ruled against U.S. duties on South Korean washing machines. Our calculations show the two cases cover $1.1 billion of imports and asks what the Trump administration’s reactions may be. #7 WTO gets MES-ier (April 4) The WTO’s investigation into the EU’s treatment of China as a market economy comes after the EU applied 94 restrictions since 2008, we found. Only nine might be impacted, with a further 23 new cases needing to be reviewed. #8 7% shipping surge seen (April 18) Our preview of the shipping industry’s earnings season found revenues could increase 7% on a year earlier, led by a 10% increase from the expeditors. Container-lines could achieve their first growth on a year earlier since 3Q 2014. #9 Pence’s KORUS concerns (April 18) U.S. Vice President Mike Pence’s tour of Asia included a warning to South Korea that its trade deal could be reviewed. We flagged that it may need to invest more in the U.S. – its FDI is only 8% of its trade surplus, compared to 84% for Japan’s. #10 Steel’s national security issues (April 21) The administration launched two “section 232” national security reviews during the month. The first looked at the steel industry, and could take up to 270 days to complete. We looked at 2,000 country-product pairs and found Brazil and Russia could be in Commerce’s crosshairs. #11 Aluminum’s national security issues (April 27) The second “232” review was into aluminum. Our deep-dive showed Canada, Russia, the UAE and China are potential targets. Targeting Canada may clash with NAFTA while Chinese foil is already under investigation. #12 Ross swings the axe (April 25) Commerce Secretary Wilbur Ross launched surprise (at least in timing) tariffs on Canadian softwood lumber exports, rather than waiting for a ruling on June 23. Our data showed Canadian exports to the U.S. already fell 16% in February from their peak. #13 Schenker shoots ahead (April 11) Our monthly review of non-vessel operating common carriers (NVOCCs) shows the top 10 carriers’ volumes expanded 13% on a year earlier. That beat the industry average of 7%. DB-Schenker saw the fastest organic growth at 22%. #14 NAFTA without TPA = problems (April 19) Both the Mexican and American governments appear frustrated with a lack of progress on NAFTA talks. Mexico in particular may want to avoid starting talks at the time of its seasonal peak in trade surpluses, which is normally in October. #15 Trump’s cudgel, Xi’s Scalpel (April 3) President Trump resolved to use trade policy with China as part of attempts to rein-in North Korea. China’s imports of clothing from North Korea could be one area for sanctions, our figures show. #16 Americans buy foreign (April 6) We take the temperature of U.S. imports each month using our shipment data, and found it was boiling over. Seaborne shipments climbed 7% for the month, with imports from China jumping 21%. #17 China’s steel promise, delivered (April 24) Our data shows that Chinese steel export discipline had begun to fail just ahead of a government decision to withdraw 29 factories’ licenses. 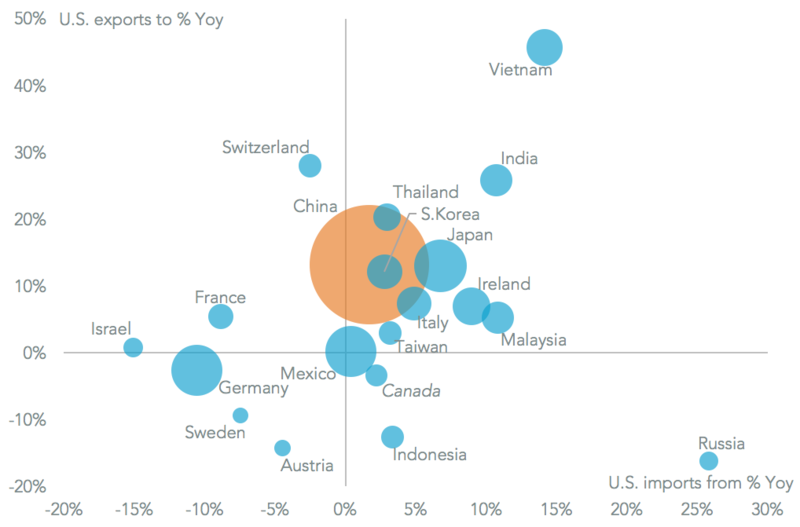 We also analyzed 4,000 product-country to see where the next trade cases may be hiding. #18 Jolly bad luck for Blighty (April 24) It appears President Trump now favors a trade deal with the EU rather than the U.K. first – indeed the door was opened to TTIP talks later in the month. That should be a surprise – the U.S. runs a trade surplus of $910 million with the U.K. but a $149 billion deficit with the EU. #19 What currency manipulation? (April 13) The U.S. Treasury Department didn’t find any countries guilty of currency manipulation, but did imply that Treasury does not believe the ECB acts in the interest of all eurozone members. We found the smallest 13 countries did more than Germany to boost the U.S. deficit. #20 A battle for the existence of alliances (April 6) The future for shipping alliances’ exemption from U.S. antitrust rules was called into question by Congress. Our market share analysis highlighted the route-dependence of such analysis while flagging the top five shippers are twice the size of the next five.